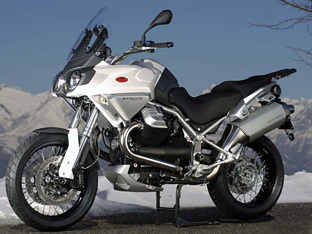 The 2009 Moto Guzzi Stelvio 1200 4V is an adventure tourer designed to go head to head with the likes of the BMW R1200GS. 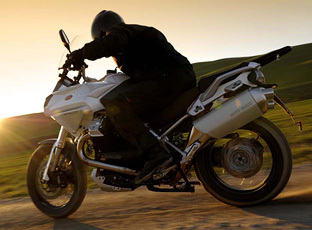 Powering the Stelvio 1200 4V is a 1,151 cc V-twin which develops 105 hp @ 7,500 rpm and 108 Nm of torque at 6400 rpm. This is connected to a six-speed gearbox with shaft drive. Fully adjustable suspension with 50mm Marzocchi forks and a Boge monoshock at the rear are fitted. Brembo brakes with twin 320 mm discs up front and a 282 disc at the rear provide the stopping power.